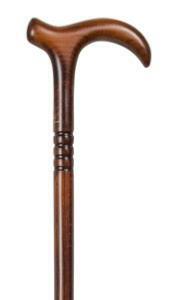 A lovely cane for everyday use, distinguished by a series of carved rings around its neck and by its attractive scorched and cherry-stained finish. Overall height 89cm. Ferrule diameter 16mm.